What a sweet little version of Holly Tea Olive. Leaves are tiny compared to the species and the whole plant is a diminuitive version of the that plant. To just 4′ x 4′ in 10 years it eventually gets progressively larger. An extremely floriferous form that condenses hundreds of small white fragrant flowers along the stems in October to December. Slow to finish in a container because of its size- be patient. Grows about 4″ per year. Foundations, rock gardens, hedges, specimen. 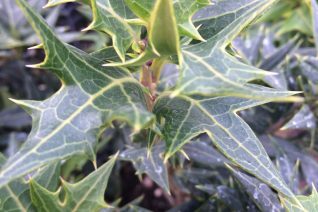 Great cold hardiness for a broad leaved evergreen. Drought adapted when established otherwise it tolerates regular irrigation which will eventually speed growth. Cute. Really, freaking cute ancient cultivar from Japan. Excellent cold hardiness as well as AMAZING pink to lacquer white new growth. This would make a perfectly stunning hedge. By late summer it settles down to a rich dark green. In October – December tiny white flowers have a sweet perfume. Slow growing to 5′ x 5′ in 6 years. Rounded dense form. Easily clipped. Excellent use as a windbreak or hedge. Good looking at all times. Appreciates any well drained site. Avoid standing water. Very drought tolerant when established. 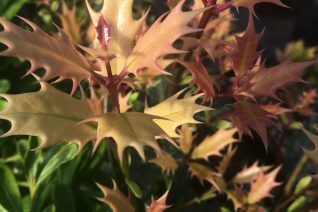 In time the leaves lose their prickles, mature foliage is smooth and glossy. Easy and long lived. Wonderful plant. Excellent cold hardy, drought tolerant shrub that reaches tree like proportions with great age. 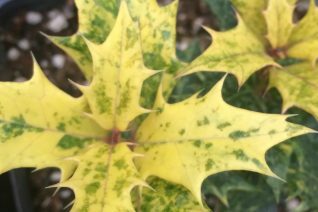 The pretty variegation presents as prickly leaves outlined in white. With age/maturity the leaves lose their prickles and become smooth and entire. The variegation on this plant is incredibly stable. I have yet to see a reversion of any consequence. Ancient specimens that are now 20′ trees can be found in old, old gardens. Its obviously been grown in this climate for eons. Very, very cold hardy evergreen that is not only hardy below 0ºF it makes a great hedge even near the Gorge where it endures subfreezing wind with no ill effects. Tolerates regular irrigation which increases the rate of growth- on average about 2′-3′ per year can be expected. 8′ x 6′ in 7 years is typical. Full sun to shade. Avoid permanently boggy soils- otherwise very adaptable- including heavy dry summertime clay. In October-December tiny fragrant white flowers crowd the stems. Moderate deer resistance. Long lived. 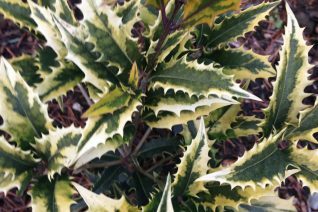 Our own discovery of a variegated form of this fantastic shrub. New growth emerges bronze with a hint of what is to come. Fully unfurled leaves are edged in yellow. 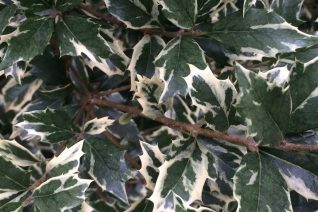 The variegation is EXTREMELY stable on a moderately fast growing evergreen shrub to 6′ x 6′ in 7 years. Best in full sun- the variegation becomes less distinct in shade. In autumn small white flowers crowd the stems. Cold hardy, drought tolerant shrub for virtually any soil that does not have standing water ever. Slow growing to its ultimate height but then larger. Excellent year round appearance. 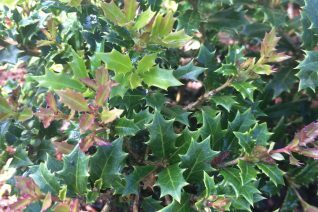 Specimen, hedge, Very easy to grow and durable shrub that adores our climate. Light water to establish but completely drought adapted then. Also accepts regular summer irrigation. Adaptable. 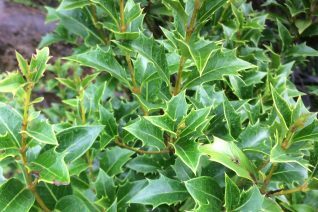 We adore this wickedly armed evergreen shrub. Its a piece of pure architecture. The sharply pointed leaves jut out like blades and are deep glossy green year round. Excellent, interesting evergreen for screen or specimen. Totally cold hardy- excellent performance in blasting subfreezing winds from the Gorge. Rounded, upright shrub to 9′ tall and 6′ wide in 8 years. In autumn the stems of older wood are crowded with tiny white flowers that emit a sweet perfume. Bloom Sept.-Nov. and sometimes later. The fragrance carries quite a distance on mild days. Light water to establish then completely drought tolerant in average, well drained soil. Also accepts the regular irrigation of borders. Good bet where deer are a menace. Full sun to quite a bit of shade. Great barrier hedge. Wonderful, useful, well scaled variegated hardy Tea Olive that is also incredibly hardy to cold. 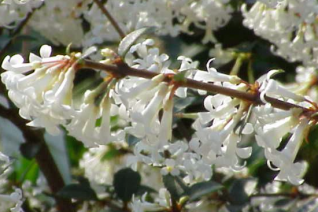 To 4′ x 4′ in 8 years this slow growing dense shrub has new leaves that emerge tinted pink, mostly cream and then settles to green leaves with splashes of cream. Excellent appearance year round. Great shrub where subfreezing winds are brutal. In October to November the tiny white flowers cluster around the leaf stems and crowd the twigs- they emit a sweet perfume detectable quite far away on mild days. Good deer resistance when established. Average to enriched, well drained soil. Light summer water. Full sun to quite a bit of shade. Very drought tolerant when established. Pretty. Long ago I dismissed this tall sweetly scented Tea Olive as hopelessly tender in our climate. Then in a garden in Lake Oswego under towering firs I ran head on into an 18′ tall perfectly happy specimen. Looks like it had never suffered damage. It was just a really nice broadleaved evergreen tree. Copious amounts of small off white flowers crowd the stems beginning in autumn in our climate and then sporadically until spring. The POWERFUL fragrance they emit is that of apricot/freesia/rose and it travels- detectable 20′ away when in full bloom. To 15′-20′ tall apparently. Requires protection as a young plant and it really should not be in an exposed site. Instead locate near a house wall- where you can open the windows and let the perfume flow- and gain added protection. Gains much, much, greater hardiness with age. Summer heat seems to play a role- the more heat in summer the hardier in winter. Full sun to high overhead shade. Grows 2′-3’/yr. when young- aided by consistent summer water. Otherwise established trees need little. Not a plant for cold gardens. 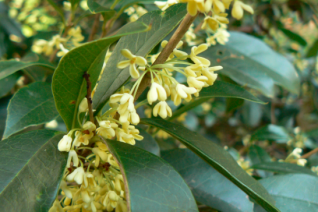 Regal, tough, evergreen shrub that loves our climate and performs beautifully in a host of situations. 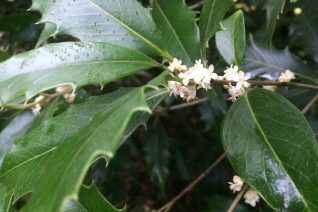 Small holly like deep blue green leaves are completely obscured by masses of small, white, sweetly fragrant, tubular flowers that crowd the stems in April. Beautiful. To 4′ x 6′ in 6 years. Full sun to quite a bit of shade which doesn’t diminish bloom. Rich, to average soil including dry clay soils but never anywhere there is standing water. Extraordinarily drought tolerant when established and will still thrive and bloom with none. Elegant clipped hedge which will become dense and still bloom heavily. The leaves are small enough that shearing does not mangle them. Long lived and cold hardy to 0ºF. Easy, elegant broad leaved evergreen. AKA Delavay Tea Olive. Fastigiata is very much a misnomer in the case of this excellent hardy Tea Olive. After growing it for 15 years we can tell you that it in fact forms a perfectly round dense ball. After all that time it is just 4′ x 4′ and perfectly round. In October-November tiny fragrant white flowers crowd the stems. Full sun to part shade in any well drained soil that does not harbor standing water in winter. Very drought tolerant when established. So useful as a NO PRUNE hedge. Perfect size for small gardens. Hardy below 0ºF. 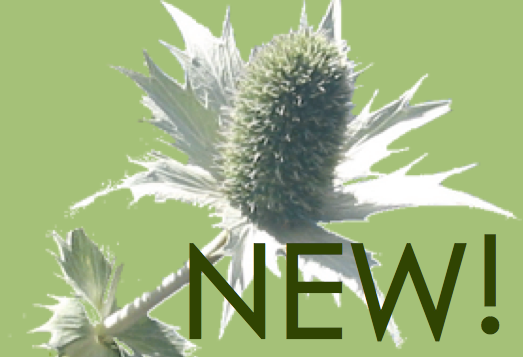 The leaves change from prickly to smooth and entire with age.